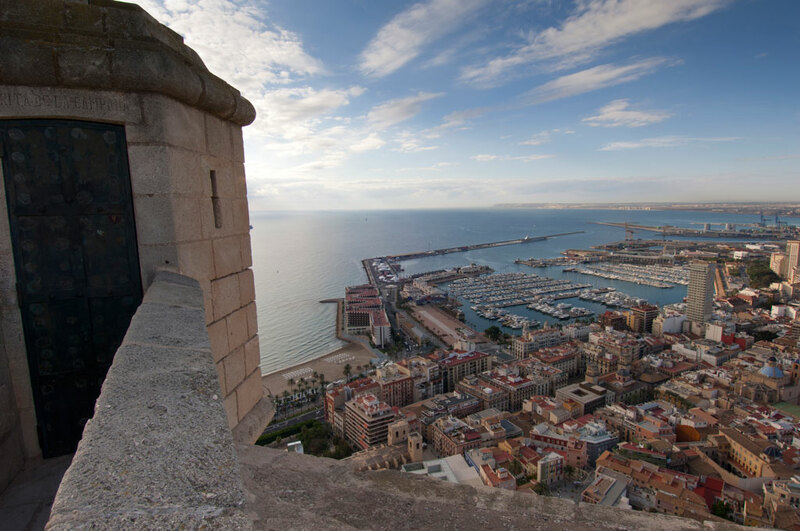 Alicante boasts many treasures. And among its most prominent is indisputably the Castle of Santa Bárbara, which stands on Mount Benacantil overlooking the city. Hewn from millenary stone, this fortress has witnessed centuries of history in this ancient city – and even played a leading role in several chapters. Our adventure begins next to the car park, in the largest of the six cisterns that once supplied the castle – and up to 14,000 soldiers, at one point – with water. This construction dates back to the 16th century and, with its very high ceilings, has been hewn out of the rock in such a way as to provide a form of natural air conditioning, keeping the cistern at a pleasant and consistent temperature. 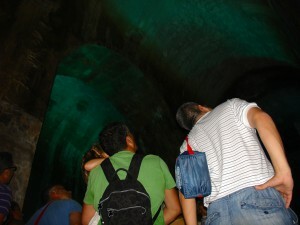 Here we learn curious facts such as how limestone was rubbed on the walls to keep them waterproof and how carp were released into the water to keep it clean. Upon exiting the cistern we meet our first character: Jacinta “La Emperadora” or Jacinta “The Empress”, a beggar woman who brings to life one of the most recent chapters in the castle’s history, the 1950s, when Santa Bárbara was abandoned and became a refuge for the city’s poor. 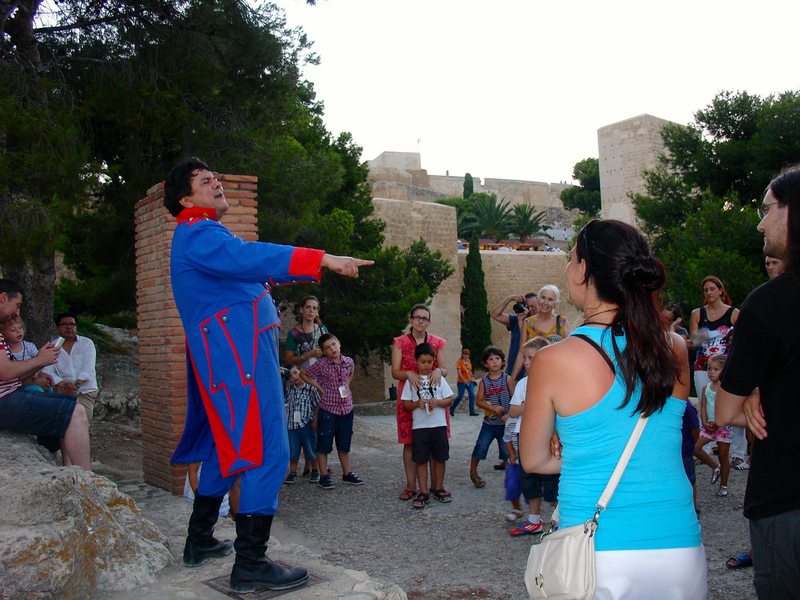 Jacinta entertains us with tales of what these unusual inhabitants would get up to, and weaves in two of the legends that surround the castle. First up is the legend of La Cara del Moro or The Face of the Moor, which tells of the star-crossed love between Alí and Princess Cántara. Its tragic end, which sees the princess throw herself from the castle on top of Mount Benacantil because she cannot have the man she loves, left behind the face of a Moorish man carved into the rock – turban and all – visible from El Postiguet beach. 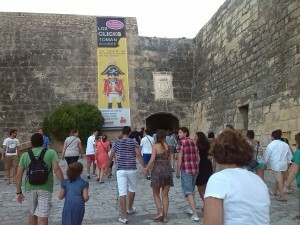 Historical fact meets popular legend in the story of Nicolás Peris, the one-time governor of Santa Bárbara who battled so staunchly to prevent the fortress from falling into the hands of Jaime II in 1256 that he died with the keys in his hand, clutching them so tightly that the only way to prise them free was to cut off his hand. To this day, it is said that on some nights the governor’s wails can still be heard, as he laments the loss of his beloved castle. 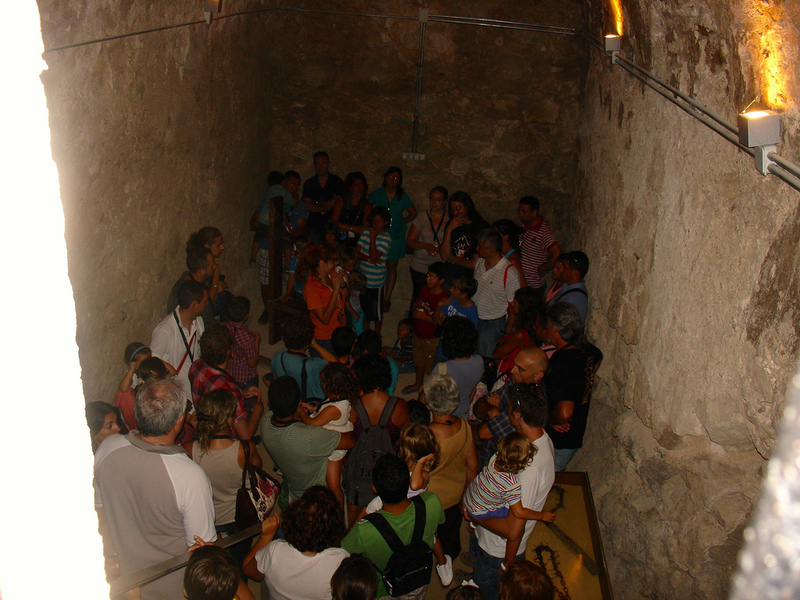 Next stop on the itinerary is the dungeon: a cold and gloomy place in which visitors are introduced to characters who tell of the 50 prisoners held there in the dungeon during the Spanish Civil War. One by one, these prisoners scratched their names into the stone using a nail which they passed around – graffiti which can now be found set into the floor of one of the castle’s lookout points. Instruments of torture and death are on display around the cramped and dingy dungeon, providing an atmospheric backdrop for the stories narrated by the guide. 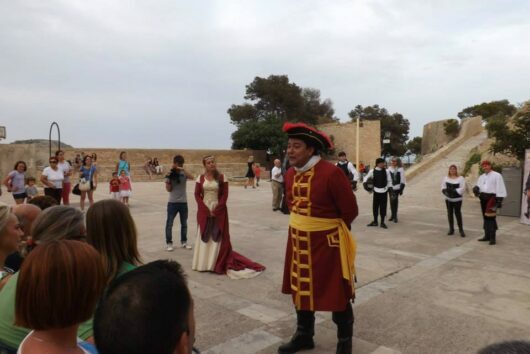 This theatrical tour brings the past to life, highlighting the main chapters in the castle’s history through the use of actors. Enter Remigio el Bombas, an artilleryman from the Spanish War of Independence. He recounts, among other things, the story of how the castle’s Chapel of Santa Bárbara was blown up, claiming 70 lives, including that of the then governor. And he gives this account from up in the ruins of La Tahona, the old flour mill, gesticulating wildly below the gunpowder store. Nearby, you can still see old millwheels, if you look closely. Sunset creeps upon us, painting the sky red as we continue our tour. 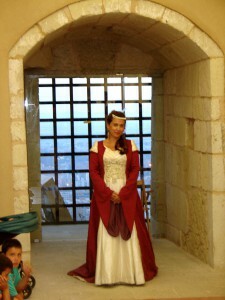 We enter one of the halls in the castle, where, amongst the coats of arms, another historical figure, Doña Violante de Aragón, tells us how she managed to deflect the pressures put upon her by her anxious husband, Alfonso X El Sabio,to bear him an heir – an heir who would consecrate the alliance between the kingdoms of Castile and Aragon – by feigning a pregnancy that did not, unsurprisingly, reach full term. Violante’s somewhat humorous account is tempered by our guide, Sara, who provides the appropriate historical rigour, and it is with a sigh of relief that we, the audience, learn that the couple then went on to have 10 children. Just a few metres away, in the moat, we meet the final character: Marshal Claude d’Asfeld, protagonist of the explosion in the mine during the War of the Spanish Succession. 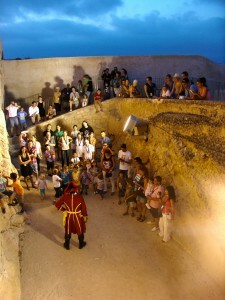 Speaking with a thick French accent and dressed in period clothing with a sword in his hand, the actor reveals the ins and out of this, one of the most famous – and most incredible – events in the castle’s history, in which French troops placed 1,500 hundredweight of gunpowder in the mine in order to force out the English troops stationed in the castle. The fuse was lit on 28th February 1709, while the English were enjoying a gala dinner right on top of the mine – having scoffed at the French marshal’s threat to blow up the castle’s mine. While the English may not have taken very seriously the 72-hour ultimatum to leave the castle, they did construct a countermine which helped dampen the explosion but which failed, however, to avert the resulting massacre. Nevertheless, the English managed to hold out against the French siege for 46 days. 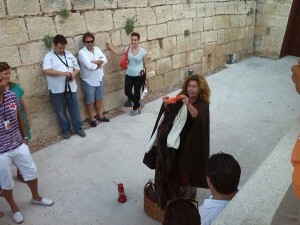 And, of course, Sara the tour guide is there once again to put the event into its historical context and provide further details and explanations. 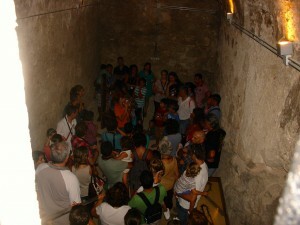 The tour is now over, and several visitors stay behind to ask Sara questions, which she answers with ease. 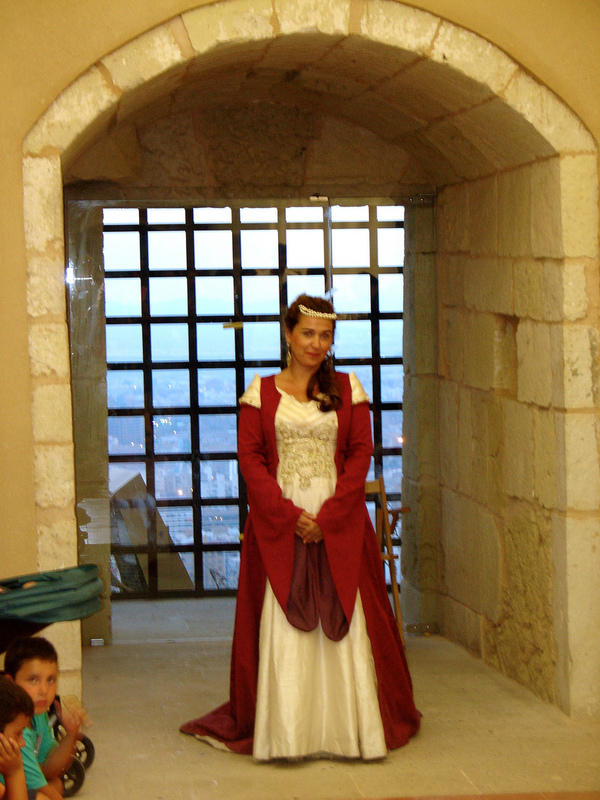 The castle is lit up, and in such a way as to evoke an idea of what it must have been like to live there during the various periods of its history – periods brought alive by Sara and the actors. The bay cannot be seen, but you can sense its presence, and a feeling of great and joyful freedom on high. 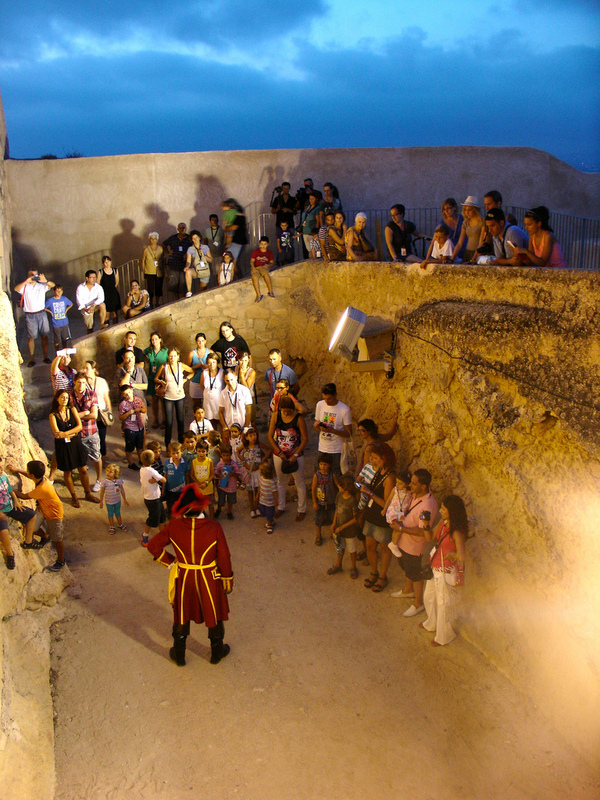 Visitors can access the castle via a lift built within the rockface opposite El Postiguet beach. You can also reach the castle on foot or by car along the road on the north face of Mount Benacantil, which starts in Calle Vázquez de Mella street. On the sea-Facing slope of Mount Benacantil is the Ereta park, an attractive open-air space with a restaurant, cafeteria and exhibition hall. The park offers superb views of the city and its Old Quarter, which can be reached easily via the various entrances to the park. 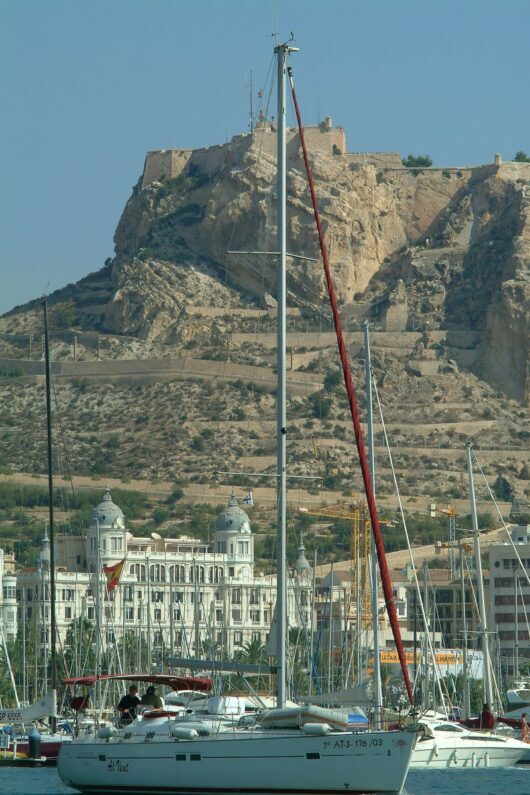 Curiously, when viewed from El Postiguet beach, Mount Benacantil looks like a human face in profile which is known as “La Cara del Moro” or “The Moor’s Face” and is one of the city’s most emblematic images. 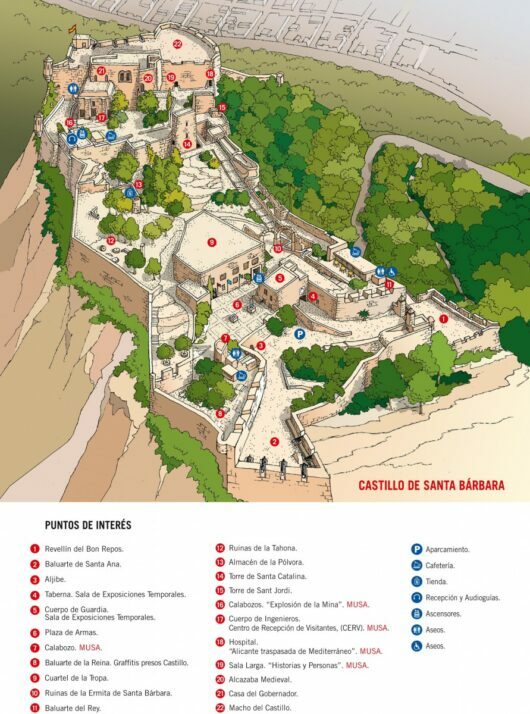 View Santa Barbara Castle on a larger map?